The Renaissance Indian Wells Resort & Spa is nestled at the base of the majestic Santa Rosa Mountains in the exclusive community of Indian Wells, the luxurious Renaissance Resort is the desert's finest oasis. The desert blooms with opportunities for fun. Venture to our nearby canyons for exhilarating hikes and bike tours. Then explore the boutiques and restaurants of nearby El Paseo, the "Rodeo Drive of Palm Springs." 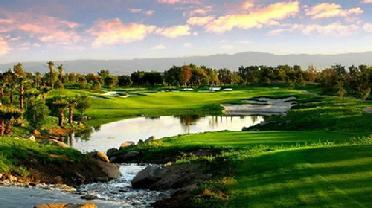 Discover the Indian Wells Golf Resort, home to the LG Skins Game and Southern California's premier golf destination. Among its many accolades, the Indian Wells Golf Resort holds the distinction of being the only 36-hole public golf facility on Golfweek's Top 20 "Best Courses You Can Play" in California. The Indian Wells Golf Resort is located within walking distance and is and ideal venue to host tournaments and group outings. With most holes oriented north/south to take advantage of magnificent mountain views, scenic water features and a vibrant landscape, Clive Clark crafted a course that is both breathtaking in beauty and a challenge for all skill levels. Contoured fairways and Clarkï¿½s strategic use of bunkers combine to create an unmatched and memorable golf experience that will keep players returning again and again. John Fought's Players Course presents a brilliant contrast to the Celebrity Course. Generous fairway corridors and undulating topography add interest to approach shots. Classic elements from the golden age of golf architecture integrate with beautifully constructed bunkers to deliver an unparalleled golf experience for every player. The new IW Club, and extraordinary 53,000-square-foot clubhouse that offers a wide range of upscale amenities to complement your Indian Wells golf experience.